A while back I had a good moan about Thursdays and how so often I seem to arrive at that time of the week utterly exhausted and uninterested in whatever F1 has managed to concoct that day. In my desperation, I suggested a "Guest Spot Thursday" and one kind reader has seen fit to help me out. Andy Roberts has written a piece on that necessary evil, the commercial break. It's a subject that I have not looked at in the blog (I guess I gave up on that score when the BBC lost F1 to ITV) and Andy's thoughts are well worth reading. Enjoy. 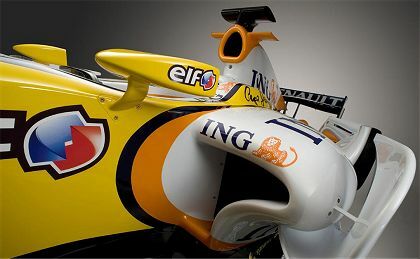 I am a newbie to Clive's blog but, since discovering it a few months ago, my grasp of the various issues in F1 has increased exponentially. The amusing side-effect has been that for some reason I now want "Quick Nick" to win and "Mad Max" to quit. I digress; this blog's technical discussions are frequent and fascinating. The leadership, politics and commercial aspects of F1 are just as frequently mentioned. But what of the other sort of commercials: The Ad Break? Just like the rest of the readers of this blog I am really looking forward to the start of the season. And like many in the UK, I'll be setting my alarm to watch the live coverage. I'll sneak downstairs, trying not to wake my girlfriend and I'll watch the whole thing, wrapped in a spare duvet and drinking a large cup of tea. Just as I've done since being old enough to convince my parents that it was a sensible idea. It's my treat to myself. But part of me is dreading the first race. What will I miss during the Ad breaks this year? I am sure other readers of F1 Insight can list more classics than me, but remember watching Hamilton struggling with that gearbox gremlin in Brazil? No, neither can I... because, like it or not, I was being told what detergent I should use in my dishwasher. If I had one. The UK seems to suffer fewer interruptions than many other countries, so I suppose I should be grateful. In the US for example, the same half hour episode of Friends is punctuated far more often. Check the DVD: missing the breaks saves you 7 minutes of your life. Although your dishes won't be as clean, shiny or smell as fresh as mine. I suppose, fundamentally, I just don't like the way TV is heading. Companies use ever more sophisticated psychology, messing with my mind through clever and innovative adverts so my subconscious reaches the conclusion that their products are clever and innovative too. I like to research purchases, feel that I am making an informed decision and that I am in the driving seat. But the world of marketing means it's more about brands and perception than reaching engineering perfection. Maybe that's the way that F1 is heading too: it's all about perception. It's often been the case that through a wildly exuberant commentator races actually *seem* more exciting than they are. Then hours later, looking back at the race, you struggle to find more than a couple of interesting moments. It's all about adjusting our perception, to keep us watching at all costs. It's no coincidence that the latest suite of graphics we see on the F1 coverage give us detailed information about engine revs and G-forces. Sure I love the technology as much as the next bloke and it's exciting to see that. But does it add anything? No, it adds to our perception that something exciting is happening: "Wow that was nearly 19,000 revs from a V8". Sure it's interesting, but it's not the reason I get up in the middle of the night to watch the first race of the season each year. I was lucky enough to enjoy an NHL game on a recent trip to Calgary. Wow. The action was superb, the atmosphere was incredible and I'd thoroughly recommend catching a game live if you ever can. But they have a solution to this Ad Break issue and viewers never miss a moment of the action. The answer? A little red light. This light on the side of the rink tells the referee that they need to take a 3 minute break. He blows the whistle, play/fights stop and the players skate round to keep warm. Fights/play resumes where it left off 3 minutes later and it seems to work. It just highlights the relative importance of the commercial break over the sporting spectacle though, which for me is a crying shame. Not sure how that might translate to F1, but I'll bet Bernie is working on getting a little red light of his own. I also dislike the fact that I have dedicated 2 hours in the middle of the night only to have the most action happen during a commercial break. A solution that I have found is actually from the UK broadcasts that we get here for Football. The sponsor for that time is allowed their logo under or over the score. Just big enough that whenever you want to see how much time is left in the match you read it. I think that this may work for ITV in Europe and the UK but I doubt that SPEED in the US would accept it. I cannot be the smartest person thus I am sure that something like this has been suggusted and outright abandoned. Shame it would make for a big decision for when to go to the bathroom or not!! Recently I saw a suggestion that is sort of the reverse of your proposal, John. Why not run the ads but continue coverage of the race in a small window in the corner of the screen? That looks to me as though it would keep everyone happy. ABC last year did what they called "ride along" they would split the screen on an IRL race and show a commercial on one side and the race on the other. The sound was the commercial so I had a hard time with it. You see Clive I was in Marine Corps Artillery. Distorting things like that give me a head ache. I like the logo on the bottom or the top or near the time. F1 could put it below the lap counter. The problem is that I don't think advertisers would be happy with just a logo, John. I can see them wanting to tke control of the sound and to squeeze in their ads as well. It is a major difficulty with televising F1 - there are no natural breaks for ads but the advertisers still want their airtime, understandably enough. As we see the races delayed here in Oz, we don't lose too much action with ad breaks as these are allowed for with the telecast. They try to show ads when the safety car is out for example. And the ads do allow for valuable tea or toilet breaks so I don't miss any of the race ! But at the time I am watching races, every minute of sleep counts and wasting 30 minutes or so watching ads at 2am does tend to get a little annoying. I don't like the idea though that the sport needs to be curtailed in favour of ad breaks. Certainly it would not work in F1 (would all the cars go back into pit lane for 3 minutes every 10 laps or so? Yuck !) and I question the need in any other sporting arena. I think the best solution is to have blocks of ads before & after coverage and leave the actual event uninterrupted. Although I personally would not watch them, I am sure plenty of people would. Last year isn't the first that the ad got the majority of the screen while a bottom window showed the ongoing race action. I haven't watched either IRL or Champ Car for at least 5 or 6 years now and I recall seeing one or the other or both using this mode. They've even used the same thing when the network had scheduled back to back sports coverage and the the race ran overtime. Nothing is more frustrating than being switched to a baseball game at the next to last lap! You needed good eyes but, it's the best solution I've seen so far-except pay per view. I'd do pay per view for F1 and a few other series. I think you are right, Clive. The World Cup draws a huge viewing audience and since most of the sponsors are sports related they'll fork out the cash for just name coverage because most of the viewers are going to know their product anyway. I think the logic may be that viewers will be so grateful they don't interrupt the coverage that they'll rush out and buy that product. That's not the case with racing. I don't think sponsors would go for that. You make some good points Andy but since I am writing an article in the same vein I am bound to agree with you. In the World Cup the the adverts are around the pitch. In the Premier league those little barricade adverts even change during the match. We se AGIP all over a race. Why not just place the ads in the circut. They could change like they do in football. Like every 10 laps of the leader they change to a new sponsor. The whole course every banner, every thing to the same sponsor. I do not like going away from the race at all. Stopping a race for 3-4 minutes will NEVER happen. Obviosly this is an issue. I am glad that someone said something about this. This has been problem for F1 on TV since the start. Pink - Did you ever miss something important during a telecast in OZ. Today with the lack of passing, just missing one pass could be the only exictment for the entire race!! In the UK, OFCOM's rules require there to be a distinct separation between adverts and programme content (Section 3.1 of the OFCOM Broadcast Codes), which would preclude the sort of picture-in-picture solution Clive is talking about from occuring in the UK. Personally, I'd prefer Pink Peril's solution of putting breaks before and after but not during the race. The trouble is they're worth less money there, so we risk finding that the races go onto pay-per-view whether we can pay to watch it there or not. What an excellent idea, John! There are barriers all round the circuits just begging to have ads placed on them. Also, those huge run-off areas could be painted or stained with logos, rather as the NFL does with football pitches. Dang, it's a difficult one. Alianora- That is an antiquated law and should be administratively eliminated. No one would watch a block of adverts at the beginning. If they put them at the end no one would stick around to watch the press conference! I'm sure I'm not the only one that mutes the commercials if I'm watching a race live, and skips them entirely if I'm watching a recorded event. A huge shift in advertising is on its way, as corporations realize we are no longer a captive audience and have more choice. Of course Old Uncle Bernie doesn't really understand the potential of the internet (I'm sure he has someone to tend to emails), but I have faith that the next generation of leaders will exploit this potential. Ratings gatherers such as Nielsons in the US are changing the way that rates are being charged because of the advent of DVR's like Tivo. More money is being made online now content purchased online. I can see streaming live or downloaded races, preceded by and followed by commercials, if free, or without if paid for. I like the idea of picture-in-picture, it's a good compromise, win-win. The other option is, pause the race wile the commercial is being show. What you return to isn't technically "live," but isn't being 5 minutes behind by the end of the race better than missing the action? Probably John F ! Altough I like to think that the powers that be at the TV station are a bit more careful when they are putting the delayed telecast together so that doesn't happen. It is established fact that the biggest peak load on the national grid is at half time in a big football match or at the start of a break in one of the major soap operas because several milllion people switch on kettles at the same time. There is one irreffutable fact that can be drawn from this. A huge percentage of people who are glued to their TVs stop watching as soon as the ads come on. So why don't they try something that will cause more eyes to be pointed at the box when it is advertising? I think the solution is to offer people two ways of watching the race - the bog-standard ordinary feed interrupted by adverts (as we in Britain get on ITV today) and an ad-free, high quality, high definition version offered as a subscription. I think Ofcom should get in touch with reality and allow picture in picture. It is ludicrous in this day and age for them to think they can separate program content and advertising when we are tuning in to watch cars that are plastered with adverts race on a circuit surrounded by adverts peopled by a population who wear head to toe adverts. The same applies to all sports. Do Ofcom really think because the companies who advertise in this manner don't pay ITV any money that we can't see them? How could a half inch high advertising ticker running along the top or bottom of the screen affect us more that spending hundreds of hours every year looking at cars, drivers, trucks etc? Ofcom seem to be living in the sixties. You make me want to move back to Japan. I would gladly pay for hi-def no commercial races here in the States. 1) He tried to launch in the UK in 2002, when very few people in the UK had the equipment to go digital. Analogue Sky was still fairly prevalent then, though Sky was trying very hard to replace everyone's units with digital because it could see which way the wind was blowing. For that matter, only 13% of the possible TV audience had and used Sky of any description in 2002 (it's even less now, but then it's no longer the primary way UK viewers go digital either). The price and hassle of getting Sky was something of a barrier for the mostly-terrestrial viewers. Back in 2002, Sky was the only non-cable method of going digital, and cable was a lot rarer than Sky. Certainly over 80% of people in the UK would not have had the equipment to access F1 Digital TV+ (Bernievision in the UK) in the first place. Now, it would be possible to get substantial numbers of UK people watching digital, but only if they used Freeview or Freesat. The subscription digital channel systems do not have enough viewers each for a 2008 assault to work any better than the 2002 one for viewers. Since Bernie wishes to charge for the service, then he would need to use the slot system (not present on all set-top boxes) to decode a subscription channel (as per Setanta - indeed hiring space from Setanta would be a sensible way of doing it, though not one to tempt Bernie). 2) 2002 was a pretty rubbish time to be attracting investors into any new product because companies were still recovering from both the dot.com bubble and 9/11. A delay of a year or two, and Bernie might have been able to get one or more companies to help pay the bills in return for special considerations (ads were out, but surely hospitality tickets to GPs and freedom to use the time the channel didn't spend on broadcasting F1 for "shopping channel" purposes were possible)? 2) 2002 was not the best vintage of season to attract viewers to F1, let alone to get them to pay for F1. 3) Bernie was charging way too much for the service. Assuming you had digital Sky (which was not, and still isn't cheap), you would have had to pay about £12 a race at the start of the season. Towards the end, there was a discount - £50 for the last six races (or £6.33 a race). No significant discount existed for paying for a whole season in advance (which is surely what most people using the service would have wanted to do). To watch the whole season was therefore £182. Britain's been pretty resistant to pay-per-view anyway (preferring block purchasing where possible). When you consider that for £180, you could buy an awful lot of Sky programming for £180, the idea of paying that much for three days of programming a fortnight was never likely to work. If Bernie decided to take the Freeview/Freesat route to conquering UK digital TV in 2008, he must bear in mind that Setanta charges £10 a month for a whole month of programming. For F1 Digital+ to work, he would need to charge something approximating that for the same amount of broadcasting. While F1 race weekends could command a premium over general sporting content, it wouldn't be a very large one. 4) The commentary team did get some mixed reviews. Naturally this was in the light of British viewers still being in the afterglow of Murray Walker's commentary and back when we thought James Allen was simply adjusting to F1 commentary a bit slowly. Now that our expectations of commentators have reduced to more realistic levels (read very low in James Allen's case), this problem should not exist. In short, a combination of being five years too early (and badly timed in more immediate terms as well), far too expensive. I've never really understood the British bashing of James Allen. What is the specific criticism of his abilities? Sure Murray Walker was the voice of history, but truth be told, he was a bit of a buffoon. His mistakes may have been endearing, but they were also annoying, with Brundle spending, in my opinion, far too much time correcting him. Maybe it's just because I live on the other side of the pond that I don't get it. Please enlighten. We are too much alike, Arnet. My feeling on Hobbs is that he knows his stuff but his voice really grates on me! Murray Walker used to get lots of stuff wrong, but he did it in such an enthusiastic way that you were liable to believe him for a millisecond or two. Then you'd figure out the problem (or the co-commentator would discreetly correct Murray) and you'd kick yourself for believing him. Yet despite this, you ended up warming to his delivery again (and his ability to make a dull procession sound like the height of excitement), dropping your guard and setting yourself up for the next error he made (justifying it, perhaps, as "Oh, we got a bit carried away there..."). This is why Clive nearly got tarred and feathered on the other forum (I was there when it happened, and can verify it was true). James Allen also makes a lot of errors, but they tend to be really, really blatant and delivered slowly enough that you figure out it's an error before he's finished saying the words. So you'd simply come away with the impression that he was a bit unobservant (at best). A very predictable, repetitive delivery means that the viewer doesn't get back into the flow of the race. Add to this some extreme nationalism (first he spent 50% of his time talking about Button, then 70% on Hamilton) that isn't even even-handed nationalism (Brundle often has to remind him that Coulthard, Davidson and now Button are also British, in addition to filling in on other drivers) and results in the impression that James thinks there are only about four drivers on the track (on a good day - there have been commentaries this year where you would have thought only Hamilton turned up). And then there is the strange terminology James uses. Murray occasionally invented words and Martin does it a lot more often, but at least their new words usually described something in a way that allowed the rest of us to understand what was meant. James' often don't. Oh, and he is prone to saying words like "certainly" to preface nearly everything. I suspect he may have caught it off Steve Rider, who is similarly afflicted. I suppose we should consider ourselves lucky that James actually says his own stuff - sometimes. For sure, you're right, Alianora. Anyone who thinks that "certainly" is a reasonable substitute for the FIA's mandatory phrase, "for sure", has to be raving, for sure. For sure, James must be very irritating to listen to - glad I'm in the States now. For sure, that's for sure. :) It's the frequency rather than the choice of term that annoys me, though - he makes "certainly" a non-word.